Earlier Harvest: A rooted rosemary plant from a cutting will mature quicker than a plant started from seed. 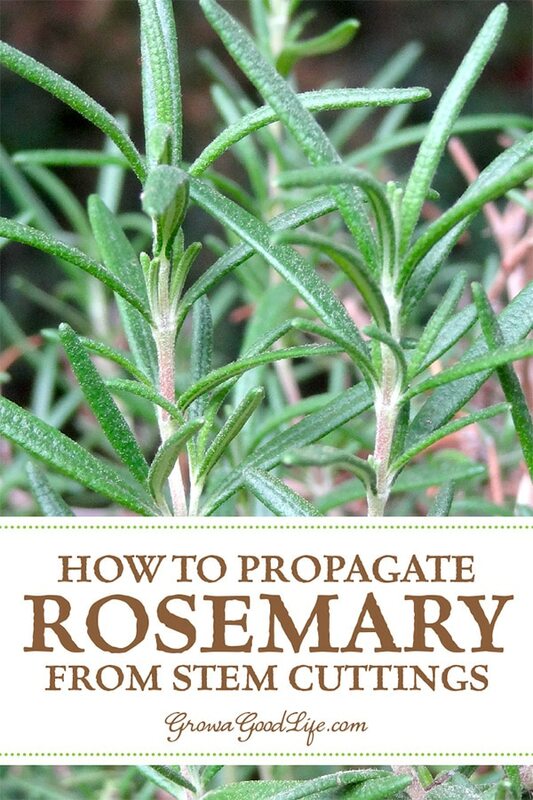 Rosemary seeds tend to have low germination rates and take a long time to sprout and grow. A rosemary stem cutting will reach a usable size in just a few months, so you will be able to harvest rosemary sooner. This article was originally published March 23, 2015. It has been updated with additional information, new photos, and video. what is the reason for stripping leaves off of the bottom of the cutting? Steph, The bottom leaves will just rot in the water. It is better to strip them off. I have tried to grow rosemary several times but it always dies. One of the times that lasted the longest was a year plus but it barely grew. The last plant was store bought and lasted only a few weeks before it started to turn brown too. I suspect root rot but I always don’t know how much to water. What else could be the problem? By the way, I live in a hot tropical climate with tons of sun and rain. JL, I too suspect root rot from too much watering. Rosemary also absorbs moisture from the air. So your tropical climate is the perfect environment for it. Let the soil dry out in between waterings. The easiest way to tell is to stick your finger into the soil. If the top 1 to 2 inches of soil feels dry, it’s time to water. Let the water drain well through the bottom holes. I also live in a tropical climate, SW Florida. I bought a small cheap rosemary plant, put it outside in a good sized planter with potting soil, and watered it very infrequently. It is now a huge bush! I just left it in the sun, in the pot; it germinated and grew. When too big for the pot, I transplanted it and staked it in my yard, and now it is enormous! The thing just grew on its own! Sometimes the more you fuss over a plant the less it responds; this one is just that, self-growing! Marg, You are lucky to be in a climate that is favorable for rosemary. Rosemary can’t take our cold winters. Tom, Are the cuttings still alive? If so, then give them more time. What a well written and helpful article. I have an old and established rosemary plant that I would like to make cuttings of, to grow on steep slope for erosion control. Is it possible to put the cuttings directly in to ground after they root? I live in Los Angeles and it is very warm and mild here. Sparklegem, You may want to keep an eye on the plants and let them grow in containers until they form a good root system before transplanting. They need more moisture when the roots are small, but should be fine to transplant once the plants mature a bit. We’ve been having issue of brown spots on the leaves / needles of rosemary plants. Any suggestions on how to fix it? Billy, many things can cause brown spots on rosemary leaves including disease, fungus, or spider mites. More likely, overwatering is the cause of leaves turning brown and dropping off. 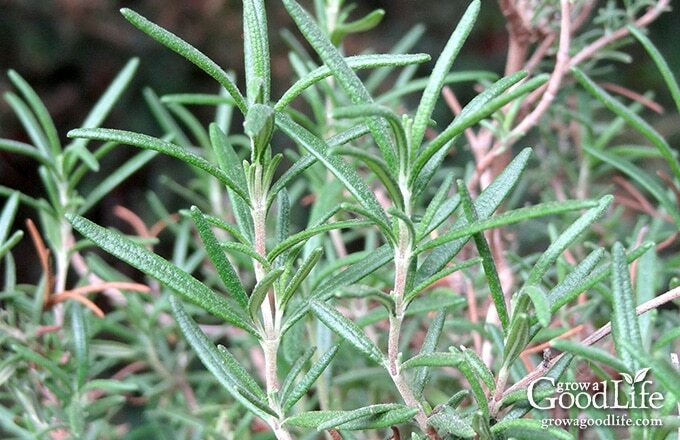 Rosemary prefers well-drained soil and moderate moisture conditions. Make sure your soil drains well and let the soil dry out between waterings. Hi. I’m Marva from Jamaica. I’m just beginning to try gardening as a new hobby. I went to the outdoor market today and saw some rosemary. I used to live in a place where almost everyone had a rosemary hedge. So I thought this would be a great project to try down here. Thank you so much for the simple step-by-step guide. I can’t wait to see how this’ll all turn out. I have bought one of those Christmas shaped rosemary trees and would like to use it for cooking but then replant outside here in the Phoenix AZ area. Is there a good time to do so? It still gets freezing here at night into winter but I have also left this in the pot in the past inside and it has died … the stems turned brown? Thanks for the tutorials. 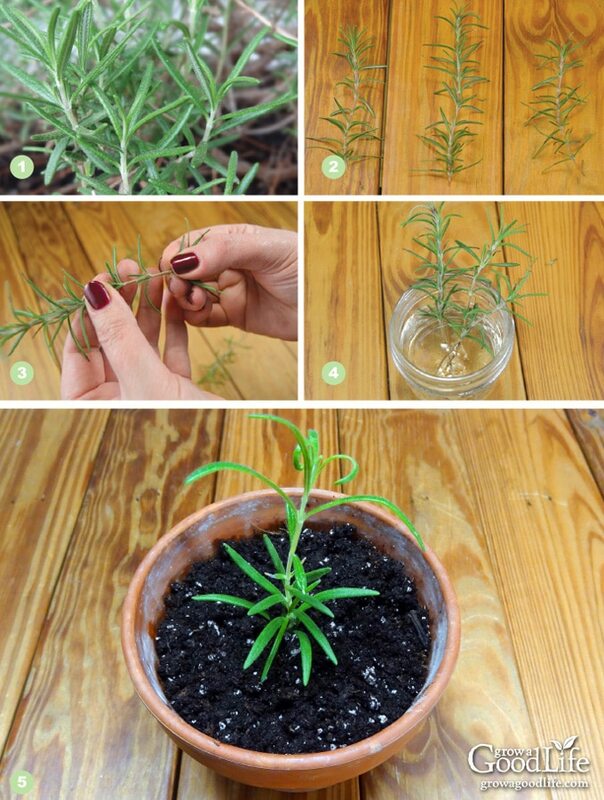 I have been trying to grow rosemary and I can’t wait to try this out. Hi there. I just stumbled across your Rosemary advice and loved the way you have written it. I live in Canterbury in New Zealand and have grown and re-propagated Rosemary plants for over 40 years, so I’m keen to see more people doing it. Here, we have mild winters with snow on the ground for less than a month per winter and only a short season of frosts. Rosemary thrives in cold and when I lived nearer the mountains I had great healthy tasty plants, both prostrate and erect. As long as the ground temperature stays above minus 5 celsius (23 fahrenheit), you should have no problems allowing the plants to over-winter outdoors. Even a few really cold nights will make no difference… and you can still take delicious cuttings anytime. Thanks for the tips, Ijan. Our winters are too cold for rosemary to survive outside, but those who live in the US Hardiness Zones 8 and further south can grow rosemary year around. These bushes can grow 4 feet tall and spreads about 4 feet wide depending on the variety. I’m in zone 7 and my rosemary has surved outside over 20 years. Will definetly try cuttings this year. Thanks for the info. Ken, That is so cool that your rosemary survives outside from year to year. It must be huge! You should be able to grow a lot of plants from cuttings. We are in zone 5 and it is too cold for rosemary in winter. This sounds like the way to go. I tried planting rosemary seeds and none germinated. Last year I managed to get one plant so I am going to try to propagate more plants from it. I think I will try rooting in water and also directly in soil. Don, I have tried growing rosemary from seed too and it seem to take forever to grow to a good size. Propagating from cuttings is much faster. Let me know how you make out. Thank you very much. I learnt alot from you. Rosemarie never makes it through the winter here either. I need to root a few and try them indoors. Thanks for the great idea. Aww you made rosemary babies! Thanks for posting. Hello from Clever Chicks Blog Hop. Great tutorial! I didn’t know you could propagate rosemary this way! Thanks for linking up with Green Thumb Thursday! I’d love it if you’d link up again this week! This is new to me — my ancient rosemary plant is dying and I was feeling sad about it. now I’m hoping I can at least keep a chunk of it. 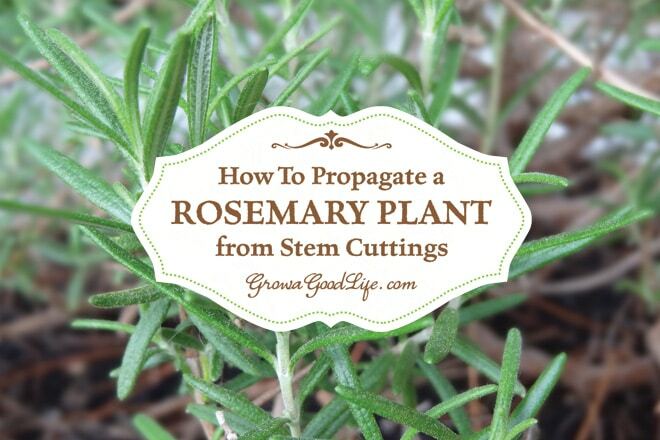 Thank you for enlightening us with these valuable tips propagating a Rosemary plant from stem cuttings at the Healthy, Happy, Green and Natural Party Blog Hop! I’m pinning and sharing! Thanks for the great information. I did not know how to do this so your post has been very helpful. Thanks for sharing on Real Food Fridays. Pinned & twitted. It definitely sounds easy enough for me. Looks like fun to do with kids so they can see the roots start in the water. Should they be put in soil as soon as the roots appear? Yes, pot up the stem cuttings once roots develop. See step #5 above for the recommended soil mix. It can take a while for the roots to grow, just keep changing the water every few days to keep it fresh. Another great tutorial! I do something similar with our lavender except I place in little pots of soil instead of water. I will have to try this 🙂 Thank you for sharing on the Art of Home-Making Mondays! I love that you posted this! At our former home we had an old rosemary bush that was easily 4 feet tall! I have a smaller one now, but I would like to propagate more from it. I think I can handle this method! Oh! And I am stopping by from the Back to Basics link up! Thanks Ken! I’m impatient and like to see the roots before planting in soil. Isn’t it wonderful to be able to grow new plants this way? I live in SW France, clay soil, short hot summers, long wet winters & just break a branch (woody) stick it in the ground and it grows! My 2 year old rosemary plant bit the dust only a couple of months after being brought inside. I’m so horrible with indoor plants, that I suppose the real miracle was that I was able to overwinter it the first year! Hi Craig, I am not sure what your comment means. Rosemary is cold hardy to only 20°F (zone 9). Those of us in colder areas need to bring the plant indoors if we want it to survive. cover mine when cold and open it up to sun when I can….its beautiful still. Wow. Shannon, that is wonderful that you are able to keep your rosemary alive by covering it. I live in zone 7 (mid-state North Carolina). I have had one ever spreading rosemary plant for at least 5 years. It’s planted in ground. I never bring it in. It’s one of the more robust plants in my garden. Laurie, You are lucky! Rosemary does not survive our winters outside. We are in zone 5. Rosemarinus ‘Arp’ is slightly more cold hardy, listed to Zone 6. Where can I purchase rosemary seeds? Don’t bother with seeds – just buy a package of fresh rosemary at the grocery store. Rosemary seeds are said to have a low germination rate. None of my seeds (fresh) germinated. Janet, Yes, I have only succeeded in growing rosemary once from seed. It took a long time to germinate and reach harvest size. It is much quicker to propagate from stem cuttings.